Personal Trainer Fourways: It All Starts Here!!! Dainfern, Sandton, Lonehill, Kyalami, Midrand, Randburg and surrounding areas. 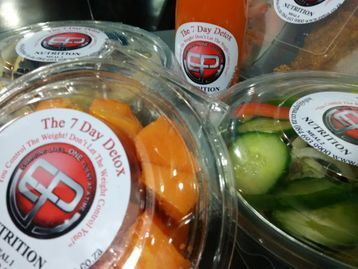 The 7 Day Detox Nutritional Guideline has been formulated, designed and used for over 20 years to help clients rid the body of toxins that have been stored up through bad eating habits and lifestyle neglect. The 7 Day Detox Nutritional Guideline consists of five meals spread out over the day every three hours to help balance out your sugar levels and speed up the metabolism. Over the years every one of my clients has used the 7 Day Detox Nutritional Guideline, not only to rid of toxins, shred some unwanted fat and water retention, but to also help kick-start a healthy eating plan and lifestyle. I've even had some clients quit smoking after completing the detox. I'm sure you are tired of all the FAD diets and weight loss myths? Allow us to design a Personalized Nutritional Guideline for you once you have completed the 7 Day Detox Nutritional Guideline which will be personalized to your calorie needs and personal goals. Everyone is different but the rules of weight loss remain the same. Having a personal trainer that understands your needs and fitness levels will only assist you in achieving your goals through correct training techniques, nutritional and supplementation advice. You will also be able to continue your training in any gym feeling comfortable whilst performing each exercise with the correct technique and form. Don't wait till it's too late! Order your 7 Day Detox Plan today to kick-start your full-body transformation. Those who have already, are on their way to a healthier lifestyle. You can to by either emailing us or contact the below-mentioned number to place your order. To place an order or inquire about the 7 Day Detox Nutritional Guideline please send an email to info@eptsa.co.za or call +27 84 693 9900. "I lost a total of 2.9 kilograms. I am happy with that in 7 days." "I found the detox to be much easier than anticipated. I was hardly hungry and thought I actually ate quite a lot. I loved the variety of food and the fruit salad was amazing. The only thing to remember is the planning, as it is the planning of your meals every day that will assist you in the success of losing weight. As I wanted to spoil myself with the type of fish I ate, I spent money on different types of salmon and that at times can be a bit costly. None the less, the detox was a great success and I ended up losing 3.6 kilograms over the 7 days in conjunction with the exercise 3 times a week. I will certainly be doing the detox again!" "I found the detox extremely easy to follow, delicious colorfully food. Was fun and I definitely didn't starve or crave while I was on it. I would recommend it to anyone that wants to detox and feel better and loose a few of kilograms in a just 7 days." Elite Personal Trainer SA - Fourways is situated in the heart of Fourways at Dynamic Health Exclusive & Private Personal Training Studio. We are ready to provide you with our professional, committed and dedicated services to the Fourways, Dainfern, Sandton, Lonehill, Kyalami, Midrand, Randburg and surrounding areas. © 2019 Personal Trainer Fourways: It All Starts Here!!!. All Rights Reserved. What is Elite Personal Training?